Becoming American series -- "The Search for General Tso"
Continuing Writing Workshop, "Finding the Writer Within"
Open Mic and Share Poetry Series: Reading with Sharon H. Chang "Hapa Tales"
Panel Discussion: What responsibility does the news media have to “confront racism”? Question: Would anyone be interested in a week-long writing intensive in Hawaii? Let me know! Michigan Historical Society State History Award for Best Article in Michigan History Magazine, "Vincent Chin: A Catalyst for the Asian-American Civil Rights Movement." Using Asian/Pacific Islander American (APIA) stereotypes in the media as an easy and visual entry point into APIA history and identity issues, examine connections between APIA media stereotypes, identity issues, and what contemporary APIA creatives are doing to clap back. Survey the landscape of APIA media and see how this history is more relevant than ever today. Challenge yourself to become a critical reader, savvy media consumer, and activist writer/content creator. Celebrate hot APIA stereotype busters. Why does it matter if Scarlett Johansson is cast as Major Motoko Kusanagi in “Ghost in the Shell,” or if Tilda Swinton plays The Ancient One in “Dr. Strange”? Why is Matt Damon the one to save “The Great Wall” in China, and why is Kylo Ren saving ancient Japan in “Silence”? Using Asian Americans in the media as an easy and visual entry point into Asian American history, we will examine connections between Asian American media stereotypes, historical anxieties, and what is going on today with Islamophobia, anti-immigrant sentiment, bullying, and Black Lives Matter. We will survey the landscape of Asian American media and see what contemporary Asian American creatives are doing to clap back. During this time of “alternate facts” and accusations of “fake news,” this history of representation and resistance is more relevant than ever. The challenge is to become a critical reader, savvy media consumer, and activist writer/content creator. Using Asian/Pacific Islander American (APIA) stereotypes in the media as an easy and visual entry point into APIA history and identity issues, examine connections between APIA media stereotypes, identity issues, and what contemporary APIA creatives are doing to clap back. Survey the landscape of APIA media. Meet the must-read APIA writers, bloggers, poets, thought leaders, and public intellectuals. Challenge yourself to become a critical reader, saavy media consumer, and activist writer/content creator. Celebrate hot APIA stereotype busters. "Who is the Asian American Ta-Nehisi Coates?" Unity Journalists for Diversity regional media summit panelist on "The Coming America: Writing about Religion and Immigration in a Changing Nation." Tuesday, February 3, 12-2:20, Greenhills School, Ann Arbor, Rescheduled for March 5. 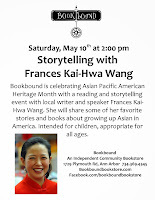 Asian Pacific American Heritage Month in May? Poetry Reading, "Where the Lava Meets the Sea"
Multimedia artwork with Jyoti Omi Chowdhury entitled, “Dreams of the Diaspora” at Smithsonian Asian Pacific American Center Indian American Heritage Project H-1B visa online and travelling art exhibit. Opening reception at Twelve Gates Arts with poetry reading and panel discussion with curator Masum Momaya. Prose Poetry Reading, "Dreams of the Diaspora"
New America Media Media Roundtable: US Citizenship - The Next Step in Immigrant Rights? Tuesday, September 10, 2013, 8:00 a.m. - 10:30 a.m.
January 15 and 16, 2013?? Opening reception for Jyoti Omi Chowdhury's photography exhibit, "Boots of Spanish Leather," together with a reading by writer Frances Kai-Hwa Wang of her newest work, "Imaginary Affairs--postcards from an imagined life." "Finding your Voice" and "Ethical Wills"
UM Understanding Race Project New Exhibits Look at Race In Our Community Public reception for photographer Mohammed Langston's exhibit "Glimpse: People of our Community" and Laurie White's video "Race in this Place: A Community Conversation"
Lion Dancing, Chinese Yo Yo, stories, traditions, crafts and activities and more! AAPS Rec and Ed course: Chinese New Year's Celebration: Dumplings! Whole Foods Market, Washtenaw Ave., Ann Arbor. Washtenaw Community College, Morris Lawrence Building, 4800 E. Huron River Drive, Ann Arbor. "Light the Night against Hate"
"What happens after the music lessons stop? Cultivating your Asian American identity and preparing for a global future after Amy Chua Tiger Mother"
So your Tiger Mother made you take all those piano lessons, Kumon, SAT prep classes, language school, and here you are. Now what? Asian American writer Frances Kai-Hwa Wang will offer some practical strategies to both cultivate our characters and prepare for a global future—how to develop a multicultural perspective, the importance of knowing our Asian American history, and the power of giving back to our communities through social justice activism. (Sorry, you still have to take more math.) The key is developing our identities as strong and proud Asian Americans. How do you teach your children about their cultural heritage? Discover tools, strategies, and resources you can use to build positive self-esteem and ethnic identity. Incorporate the teaching of culture and values into everyday life in America and prepare your children for racism. Explore the importance of teaching your child two or three languages and how to make them realize it's "cool" to go to language school. "Beyond Amy Chua Tiger Mother--What happens after the music lessons stop?--Cultivating your Asian American identity"
So your Tiger Mother made you take all those piano lessons, Kumon, SAT prep classes, language school, and here you are. Now what? 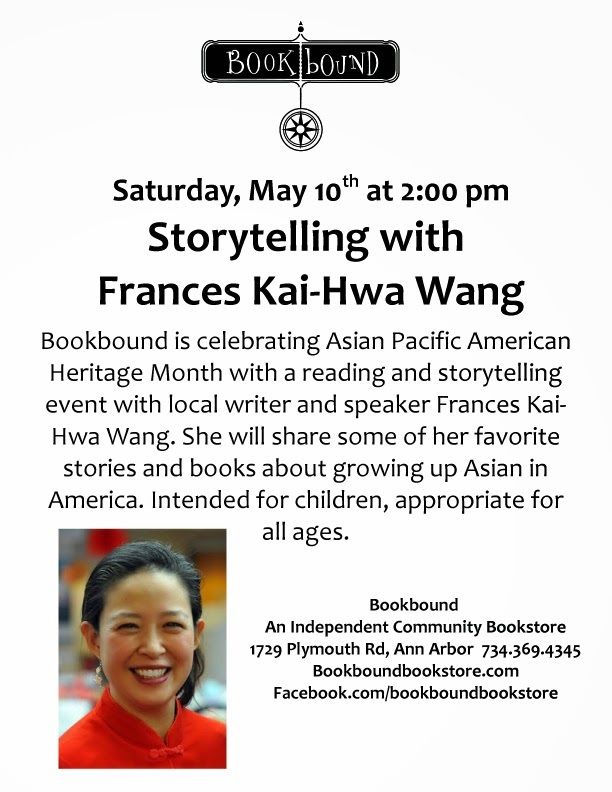 Asian American writer Frances Kai-Hwa Wang will offer some practical strategies and hands-on tools to both cultivate our characters and prepare for a global future—how to develop a multicultural perspective, how to capitalize on our family backgrounds, and the importance of knowing our Asian American history. (Sorry, you still have to take more math.) In line with the U of I’s theme of “iUnite!”, she will also address the theme of belonging—about finding ourselves, finding strength in our communities, and the power of giving back through volunteering and social justice activism. The key is developing our identities as strong and proud Asian Americans. The Mid-Autumn Moon Festival is one of the few most important holidays in the Chinese calendar. It celebrates the end of the harvest season when the moon is at its fullest and brightest. Embrace the history and traditions, learn about and taste moon cakes, hear stories of the Moon Lady and the Jade Rabbit, and complete a Chinese paper cutting craft. (Appropriate for all ages, but children must be accompanied by an adult). There will be kite-making workshops, kite flying competitions, cultural performances, and kite masters from China and Michigan. Special categories for students and community. A real town and gown and east meets west affair, much like the dragon boat races they organized at Gallup Park in 2007. Understand hands-on strategies for preparing your children for the 21st century and a global market. Raise confident children with cultural sensitivity, languages, positive self-esteem and math skills. Discover effective techniques for instilling your academic and cultural values while making your child believe that being different is "cool."